Earlier this week, or perhaps last week, or perhaps two days after my daughter was born in 2013, Sam Miller and Ben Lindbergh of the Effectively Wild podcast considered whether baseball players have bad dreams. They quickly surmised, probably correctly, that the modern athlete rarely has nightmares, with their confidence already polished into a perfect, unquestioning state. But I’m not interested in what is; my realm is what should be. And so I present to you: the nightmares of several ballplayers. Eric Davis: A long fly ball is hit to deep center, and Davis gets a good jump. It gets caught up into the wind, however, and he has plenty of time to settle under it at the warning track. He looks up and notices how blue the sky really is, and for a moment he worries that he’s lost it. But he hasn’t, and the ball floats down easily for him. Right before the catch, however, the wall topples on him from behind, crushing him. Angel Hernandez: Hernandez strips out of his gear and slips out of the stadium. On the sidewalk a father is talking to his son. “Boy, that umpire sure was terrible, huh?” the father asks. “I didn’t even really notice him,” the son answers. Michael Pineda: After a one-two-three top of the first, Pineda comes back out for the second only to find a smear of pine tar on his arm that he doesn’t remember putting on. 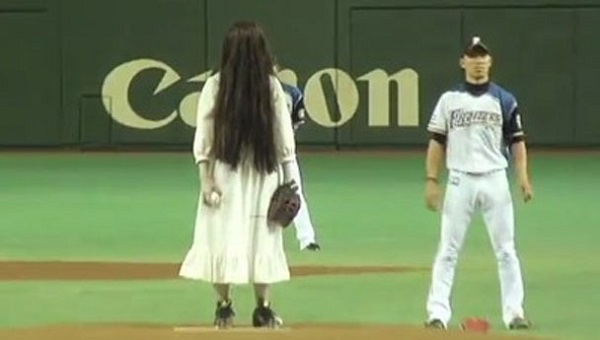 He worries that people might notice, but he pitches anyway. After getting up 0-2, he looks down again to see his entire arm coated in brown. Someone must surely notice, he thinks, beginning to panic. He can’t walk off the mound, he can’t leave, but even though everyone is acting normally, he knows they’ll all attack him as soon as they see. They’ll kill him. His entire jersey is stained with pine tar now, and he’s alone on the mound, sweating, drawing each individual breath knowing that he’s going to die. Then Showalter climbs the top step of the dugout, and asks for time. Chuck Knoblauch: It’s a two-hopper to the second baseman, and on contact he’s already starting to overthink the throw. He fields the ball cleanly, but when he tries to make the transfer his hand gets stuck in his mitt, and he can’t pull it out. The runner rounds the bases as Knoblauch watches, paralyzed by the jeers of the crowd. Carlos Gomez: Just like a normal plate appearance, except that every ball the pitcher throws is coated in blood. The evening ended the way it always does: I picked you up and gave you a hug and a kiss, and you patted my left arm roughly and told me, “hug.” Then you sat down with your mother to read your books before bed, and we blew each other kisses as I backed out the door into the darkened hallway. I went downstairs to catch the end of the game on the radio, but it was already over. I’d missed a win, the first in a while. It was a quarter to ten: a blue, featureless night. I set the alarm to 5:30 and brushed my teeth, and slumped onto the couch. It had been a rough day. It had started with promise. I came home from work to find you in the possession of new crayons, stronger than your old ones, and you sat at the table and scribbled lines onto paper. The cat jumped up on the table to check this out, and mood altered. “No!” you called out. “No no gato. My picture.” You began to cry. The cat was a visible threat, despite the fact that he wanted nothing to do with your drawing other than perhaps to sit on it and receive pets. But you couldn’t risk that. You couldn’t risk the possibility that he might force you, in some way, to share. You are nearly two years old. Now that objects have gained permanence, they’ve also earned the possibility of absence, and it’s terrifying. This is much a part of you as the omnipresent tears dangling above reddish stain of your chapped cheeks, where the molars stab at you, or the placemat you knock off the table to watch it fall to the floor, or the five plates of food, rice and plums and strawberries and pasta and beans, that spent the evening simmering in the lukewarm air. “One ice ceam,” you answered. Before the lights went off I read some more Montaigne, one of his shortest essays: “That the Profit of One Man is the Damage of Another.” He’s railing against a long-dead Athenian, who put a mortician to death for profiteering on the death of his colleagues. “A judgment that appears to be ill-grounded,” he argues, “forasmuch as no profit whatever can possibly be made but at the expense of another.” He lists professions who do well when times are bad: doctors in plagues, architects by earthquakes, merchants by the sin of greed. Curiously, he fails to mention his own line of work. Baseball is equally bad about this. It’s diverting to render baseball as a metaphor for life, but one of its more troubling translations is in the competition: that for all the aesthetic merits, the end results are zero-sum. In last night’s game, for example, Fernando Rodney had his own bad day. In one inning he gave up a warning track fly ball, a home run, a sharp line drive out, a walk, and a caught stealing to escape the game. The natural reaction was that Rodney was terrible, and he probably was; the troubling concept is that it wasn’t really imaginable for him to be fine but the opponents better. Someone has to be bad, to lose. That’s how the game, all games, generally are. Sometimes, teaching you anything feels impossible; it’s like reading the definition of a word and finding more words you don’t know. I can handle yellow and cat and squash, but causality or sharing seem utterly beyond my capabilities. If Montaigne can’t figure out how trading can help both sides, what chance does a toddler have? How do you teach cooperation in a culture steeped in winning and its obligatory counterpart? Maybe it’s just a matter of providing examples, a thousand instances of a posteriori to build your values on. Maybe you just have to learn. That sharing makes us feel better about ourselves, that other people being happy is okay, and that losers don’t always have to feel bad about the way they lose. And that your father might still love you even when he doesn’t give you ice cream. Several weeks ago, Ryan Zimmerman hit a double, and Cardinals outfielder Jon Jay looked foolish. According to the metrics, according to the scouts and the fans, according to the line drive that Jay snared later than game to send it to extras: according to all these things, Jon Jay is a good outfielder. For a moment, he was not, and earned a highlight. Lives are not lines or arcs: they are scatterplots. They are not, as we’d like to believe, a constant evolution, but instead a series of moments, discrete and disconnected, that we continually absorb and react to. The hot takes are not hot because they burn; there is no time to burn. They explode, and vanish. Such was the case with on Jay, who somehow made perhaps the worst dive of all time, and one that was immediately forgotten. Players make mistakes all the time. They swing at bad pitches, hang breaking balls, get thrown out on the basepaths like nincompoops, and make pickoff throws to the tarp in right field. Players make mistakes, and we thrill at the schadenfreude, and forget. But Jay’s dive was different: it was no error. There was no evidence of his failure. Zimmerman received no extra base. The world chastised Jay not for his weakness but for his gall. It’s exactly why I’ve discovered that I love Jon Jay’s dive, two weeks later. Not because it failed, and not because it displayed some showy, self-aggrandizing grit. Those are later moments. The one I treasure is just before. The ball, in this blurry photograph, is next to the “PIT” on the scoreboard, slicing right. In baseball terms, Jon Jay no longer exists. He cannot make the play. Perhaps he has misread the arc of the line drive, struggled to find his balance on contact. Those were earlier moments. At this exact moment, his actions no longer pertinent, Jay leaves his feet. It’s a meaningless gesture, an admission of his triviality, an act of defiance against an uncaring universe. It has no impact on the play, or on life. It has nothing to do with the flight of the ball, or the oncoming ground, or any of us. It is apart. In that moment of failure, Jon Jay is free. 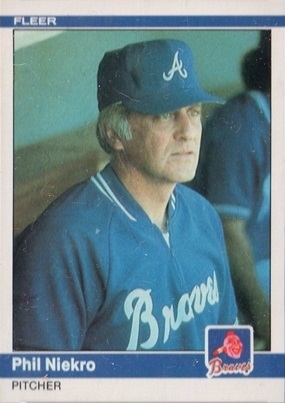 What Does Phil Niekro See? Phil Niekro sees Bob Horner, crouching uneasily at third awaiting the pitch, sees the rippling powder blue of his oversized, wrinkled pullover. And in it he sees the ocean. He hears the crowds rolling like waves, pleasant baseball cries like seagulls signaling a long-sought shore. He hears distant shanties, shapeless and rhythmic, beating at the pulse like a whip. He feels the warmth of the sunlight baked into his neck like a memory. He smells it, too, the sharp relief of saltwater, a purity so uninterrupted that it loses its flavor. It’s so thick, the air, sometimes, that he has to rub it from his eyes. As he opens them again he sees the rolling red tide wash over the sides of the boat, hears the harsh nasal tones of the bosun shouting words he and the others do not hear and already know, his arms aching with hours of rowing. He can taste the whale, soft and plaint under jaws too tired to chew, the flavor of red meat straining through his teeth and into his cheeks, rich and red like bison. He sees the glint of the morning sun on its skeleton hung from the mast, gleaming white as his own hair. He feels the heavy blanket of endless afternoon.